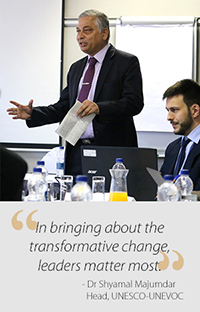 For potential change leaders in the TVET sector in Eastern and Southern Africa to better understand the regional and global development agendas, and use these opportunities to effect change in their institutions, the first ever UNEVOC Regional TVET Leadership Programme was conducted. This programme was held in Harare, Zimbabwe from the 23rd- 27th October 2017. Linked to UNESCO-UNEVOC’s flagship UNEVOC TVET Leadership Programme, this programme focused on building the leadership potential of the change agents in three areas; Strategic Knowledge, Thematic Knowledge, and Leadership and Management Skills. 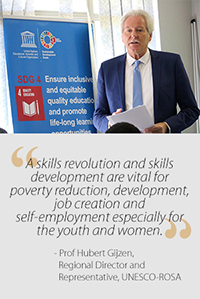 The TVET sector has gained eminence in Africa, especially since the 2030 Agenda for Sustainable Development and the Sustainable Development Goals came to the fore. Given the transversal and critical role of education in realizing many of the targets of the Sustainable Development Agenda, various initiatives have been taken by regional entities around Africa. TVET Strategy and regional framework for cooperation developed by the Southern African Development Community (SADC), development of the Plateforme d'Expertise en Formation Professionnelle(PEFOP) platform for West Africa, and the Better Education for Africa’s Rise (BEAR) project in Southern, Eastern and Central Africa, are some of the notable regional initiatives. To fully use the opportunities offered by these initiatives, there is a need of leaders, who have the vision, knowledge and skills to seize the opportunities and bring about the changes. 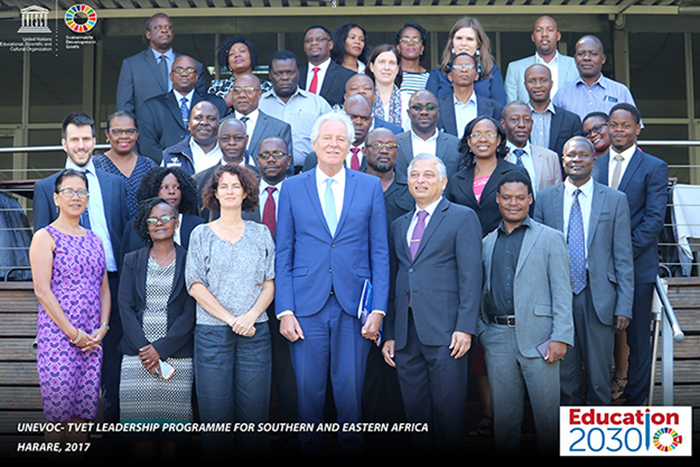 In this context, the UNESCO- UNEVOC International Centre for Technical and Vocational Education and Training (TVET) and the UNESCO Regional Office for Southern Africa (ROSA) organized the UNEVOC TVET Leadership Programme for 24 TVET leaders from 9 Eastern and Southern African countries. These included Namibia, Zambia, Mozambique, Zimbabwe, Madagascar, Malawi, Botswana, Kenya, and Swaziland. The participants composed of senior level TVET staff in governments, TVET colleges and TVET authorities. UNESCO-UNEVOC was represented by Dr. Shyamal Majumdar, Head of UNESCO-UNEVOC and Mr. Jean Hautier, Regional Focal Point for UNEVOC Network in Africa. UNESCO ROSA was represented by Prof. Hubert Gizjen, Director of UNESCO - ROSA and Ms. Carolyn Medel-Anonuevo, Senior Education Specialist and Head of the Education Unit at the UNESCO Regional Office for Southern Africa. By the end of the programme, each participant had prepared a “change project” to be implemented within their country upon their return that reflects learnings from the programme. These included: Improving access in TVET through a Career Guidance system, presented by Mozambique; Increasing TVET graduates’ employability by strengthening industrial linkages, presented by Namibia, Enhancing the attractiveness of a TVET by making a Green Campus, presented by Kenya; and Implementing new strategies to bring girls in Engineering fields presented by Zimbabwe. UNESCO ROSA and UNESCO-UNEVOC committed to provide support to the countries in implementing this agenda of re-branding TVET in these countries and improving quality assurance through knowledge sharing and policy support.